Sculptor Gutzon Borglum’s giant heads of American Presidents George Washington, Thomas Jefferson, Theodore Roosevelt and Abraham Lincoln were carved between 1927 and 1941. They are about 60ft (18 metres) high and, along with the Statue of Liberty in New York, probably the best known monument in the United States. The cleaning work on Mount Rushmore was performed at dizzying heights. Conventional methods of access such as scaffolds, powered access equipment, lift buckets and work platforms could not be considered due to the topographical conditions. For this reason the specialists had to get to their mountain-top workplaces using a carefully thought-out rope access technique. A fixed cladded core fibre rope allowed exact positioning of the cleaning specialists on the mountain. A second rope increased their overall safety and their lifelines were anchored above the work area, on the heads of the presidents. Then the specialists lowered themselves into position from this point. Thanks to so-called ascenders or rope grabs, they could move freely up and down without assistance. 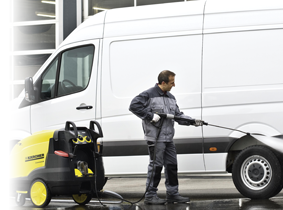 Five diesel-powered Kärcher HDS 1000 DE hot-water pressure washers, through which about 7,000 litres of water were pumped every day, performed without a hitch over the whole period. They had been lifted by helicopter and placed immediately behind the heads at the beginning of the project and were exposed to the elements for four weeks. As expected, the aim of the cleaning project – to remove layers of dirt that could damage the rock without detrimentally affecting the surface of the sculpture, was accomplished. Something that had not been expected was the fact that optical cleanliness of the monument, as perceived from the observation platform, has been noticeably improved. The heads have actually been visibly lightened by the high-pressure wash with pure boiling water and now stand out more from their natural background. Now hopefully this will inspire you to make easy work of your spring cleaning.